The area “Frankfurter Allee Süd and Kaskelkiez” is located at the Eastern inner city periphery in the district of “Lichtenberg”. With a number of 260.000 inhabitants Lichtenberg is the seventh biggest of the 12 districts in Berlin. Since the early 1990ies integrated urban development planning is being executed in the two neighbourhoods. Although the improvement of energy efficiency of buildings and supply infrastructure was not the major focus of the activities from the beginning, both areas have been comprehensively modernized step by step during the last 20 years. . 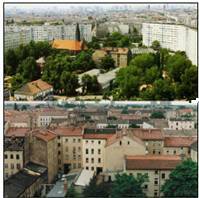 The Case Study Berlin documents integrated urban development approaches and solutions to implement EU energy/climate measures and elaborates a critical evaluation on retrospective measures and plans for the two very different residential areas. The neighbourhood Frank-furter-Allee-Süd is a large housing estate with prefabricated buildings and a predominantly residential use. Very typical for the urban structure of the neighbourhood are the large green spaces between the buildings. The area is well connected to public transport and in the north it borders on one of the main arterial roads in Berlin. With about 5 km distance to the Eastern City centre of Berlin, the neighbourhood is located at the periphery of the inner city. In 1992 Frankfurter-Allee-Süd was characterized by a relatively balanced social structure. The area was lacking facilities for youth and elderly and had a high deficit in design of public green space and squares. The neighbourhood possessed a district heating system that covered the entire area but had an urgent need for modernization. The building stock had a poor energy performance with defects in the façade as well as in the technical equipment. Kaskelkiez is located south of Frankfurter Allee Süd, separated by railway tracks. The neighbourhood has a traditional European urban fabric, composed of a scheme of roads and blocks. The blocks are predominantly built up with attached 4-5-storey buildings. In World War II the area was marginally destroyed and for this reason the neighbourhood is rich of historic buildings. Kaskelkiez is an area with mixed use, but still holds a large proportion of residential buildings. In 1992 the area was characterized by a relatively high unemployment rate (19%) and about 15% of the households had an income below the official minimum living vage. Furthermore, there was an unclear ownership situation and a lack of infrastructure facilities. Only few green areas existed and public space as well as the yards were lacking amenity values. Most of the buildings in the neighbourhood suffered very desolate structural and poor energy conditions. About 76% of the households were using coal-burning stoves. Urban development of the case study area has been steered in several planning processes throughout the last 20 years. The integrated aspect of energy efficiency had been followed imminently in the 1990ies but was fostered strongly and explicitly only since the past years. In the first planning phase (1990 – 1995) basics for development and first integrated concepts were set up. 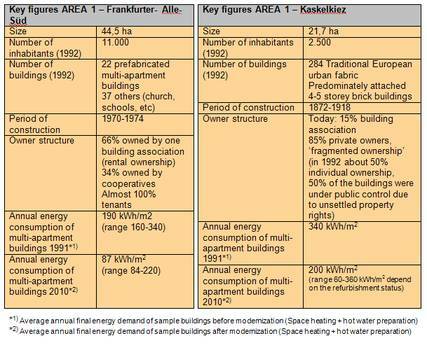 After having concentrated on constructional qualities and measures in the first years after the fall of the Berlin wall, one started to include social issues more intensively into the urban development planning pro-cesses during the second planning phase (1995-2000). The third planning phase (2000 - 2005) is characterized by integrated concepts reacting to population de-crease. Only since the forth planning phase (2005 - 2010) energy efficiency explicitly becomes an important issue. Since 2002 the public sector conducts energy-efficient refurbishment of the social infrastructure and from 2005 onwards specific superior energy-efficient measures are conducted by housing societies on residential buil-dings. Measures for the energy-efficient improvement of buildings and supply infrastructure by public and private owners now are an integral part of the activities. Various stakeholders (mainly housing societies, municipal and private supply companies) and residents were involved in legally binding and legally non-binding planning processes. In Kaskelkiez the residents were involved through an institutionalised residents' board (Betroffenenvertretung) between 1993 and 2008, when the neighbourhood was formally designated as redevelopment area. In addition to that several social, labour market-oriented and educational measures had been realized on the neighbourhood level, such as the "Climate Office Lichtenberg" ("Lichtenberger Klimabüro"), project "energy consultants" (Energieberater) or the opening of a sample “show-flat” by the housing association HOWOGE to demonstrate possibilities for energy saving. During the last 20 years numerous different measures have been implemented to improve energy efficiency and the living conditions in the two neighbourhoods. In both areas it was possible to halve the total primary energy consumption between 1992 and 2010. Reconstruction of a multi-storey building as Europe's biggest low-energy building, which is now equipped with a combined heat and power unit. A municipal housing company (HOWOGE) was founded and buildings and land properties were transferred to the company. The juridical constitution of the existing housing company was changed. Replacement of existing stove heating by de-centralized heat generators. For cost reasons at later stage the connection to the central heating system of the neighbouring district was not carried out.